Cartographers have traditionally placed Mt Sinai in what is today referred to as the Sinai Peninsular. Every year pilgrims flock to that mountain. But having located the Red Sea crossing site in the Gulf of Aqaba, it becomes obvious that Mt. Sinai must be in Saudi Arabia. The Bible itself bears witness to this fact, “...Mount Sinai in Arabia” (Galatians 4:25). 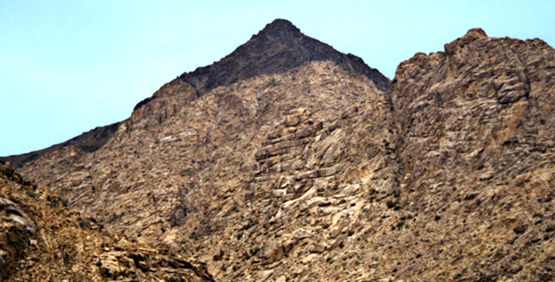 The mountain now believed to be the Biblical Mount Sinai is known on modern maps as Jebel el Lawz. This mountain encloses an area large enough to accommodate millions of people and their flocks and herds. The site shows all the evidence of being an encampment for millions of people. The are ancient tent sites, evidence of a vast water supply, and even the altar upon which the Golden Calf was erected. After Ron drew attention to this site in 1984, the Saudi Authorities erected a wire mesh fence around the base, and declared the area as an archaeological site, off limits to unauthorized personnel. THE evidence of another Biblical miracle is still standing today! 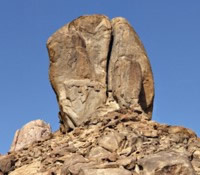 At the Lord's command, Moses smote what the Bible refers to as “the rock” in Horeb. Fresh water gushed forth, supplying the Hebrews, and their flocks for the two years they encamped there. AT the base of Jebel el Lawz is a large altar, with Egyptian Apis bulls, or calves, inscribed onto it. When Ron showed this altar to an archaeologist from Rejhard University, he immediately recognised the significance of it. There is no other site like it in Saudi Arabia. The story of the Golden Calf, in chapter 32 of Exodus, is well known, and now at last the actual altar has been found. However until the Saudi Authorities allow access to foreigners, viewing the site is extremely difficult. Yet despite this, some have successfully done so.